Countless mommy blogs show off cute little girl party themes, complete with dainty invitations and pretty pink supplies however being a mother of two boys, my outlook on birthday parties is somewhat biased. Possessing more than twenty years of experience, it is quite evident boys are hyped about their birthday parties as well. My boys were eager to participate in every aspect of the party, from selecting a birthday party theme to shopping for supplies, as well as helping prepare the snacks. I just fell in love with the Green Friends first birthday invitation from Pear Tree Greetings. The simple spaceship design atop a typical boys blue background has a classic boy association. With just a bit of creativity one could create an entire party around this little spaceship. Call me crazy because my boys are now men. Nevertheless, I envision the table covered with Mylar, aluminum foil, or another shiny material, scattered with brightly colored paper stars. Make place settings using white placemats and the guests’ names in glitter. Perhaps green frosted cupcakes could be served, decorated with a big candy eye and pretzel stick antennas. 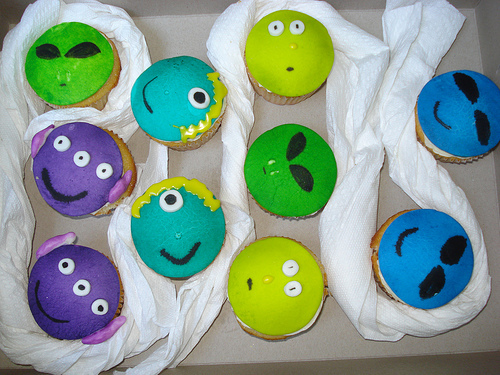 Then again, how about these Martian cupcakes, my boys would have just flipped over these! Include a few green glow wands, age permitting, shiny bags filled with treats, and perhaps a plastic laser-looking water or nerf gun and a boy’s space party is in progress. Check out Pear Tree Greetings online. They offer a whole host of simple, yet adorable 1st birthday invitations suitable for both boys and girls. NextIs your Occupation on the List?